Good morning. How are you? I hope your week is going at least as well as mine so far. 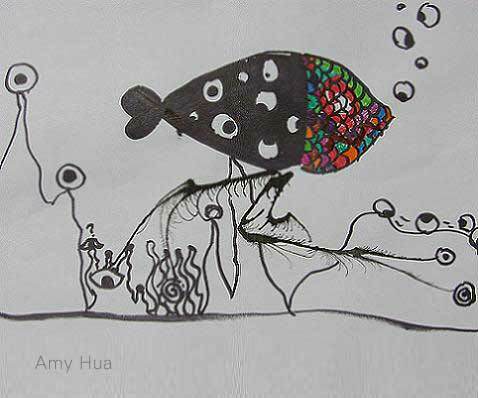 A few weeks ago Danielle Ngo's little cousin Amy commented that she's "sad of the underrepresentation of fish-monsters." Well, as you know, I don't control the monsters. They come as they desire, and any attempt to control them always leads to headaches, sharp carpal tunnel pain and nasty back spasms. But as it happens, I think the monsters sensed Amy's sadness and sent one through to please her. I hope you'll like it, too. It is a mighty strange monster, as you'll see, and its motives are mysterious to me. But I know that you're going to tell me what the story is. I can't wait to hear what you think 112 is up to! The Spiny Blob swims in many circles, in each direction, before it Becomes. Fear not, Blob-Watchers–this is normal behavior and all a part of the Process of Life. I think I’ve seen him swimming like heck down the gutters of my street on street-sweeping days. I’m definitely glad this monster decided to come out of hiding. :] I wonder how he swims, with his huge jaw hanging down like that. I think he’d be too lopsided to swim around. But I’m sure he amuses himself all day following his projectile. A happy life. Saw your piece “Ink & Circumstance” in STEP magazine. a sermon. Your piece would be easily adapable to many fields besides Graphic Arts. Keep up the good work! Monster 112 has been priced out of his neighborhood in the Abyssopelagic zone and is moving to the Hadopelagic. Packing up his place, he finds under the bed the big Rubbermaid bin of photos he took with his old Kodak disc camera in the 80s. There, Monster 112 finds a disproportionately large number of pictures he had snapped of other monsters simultaneously taking a photo of him: it had seemed like such a funny idea at the time: metarecursivephotography: but then he got the pictures developed, and whatever magical thing he thought he was capturing had managed to slip away. It’s just a bunch of photos of someone holding a camera. Into the Rubbermaid they go. His last girlfriend had accused him of omphaloskepsis, as if his esca (that’s what that appendage is called, it turns out) is just an example of the world’s most pronounced outie. Monster 112 countered that it’s only after having a staring contest with yourself that you can truly learn to know others, but maybe she was right, because she’s not here, and he’s alone, and he has to be out of his place by the first. Tonight he’s going to call you and see if you want to get back together. Before you answer, think of that Rubbermaid, filled with photos of ex-girlfriends taking pictures of him; remember that if you get back with him now, you’ll probably have to help him move; remember that he’s on a fourth-floor walk-up; remember that when you broke up with him, you left with a good line about “esca-tology” and you probably won’t be able to come up with another zinger like that in a million years. My advice is to wait until after he’s moved into the new place and then see if he’s still interested. If so, let him know that you are a magical thing he let slip away, and that if he forgets it again, there are other fish in the sea. Melanchton gilt als einer der gebildetsten und weitgereistesten unter den Tiefseemonstern. Bei einer seiner Bildungsreisen ist er mal Herrn Arafat, der mit dem Tuch und den gewaltigen nacktschneckengleichen Lippen, sehr nahe gekommen. Nicht seine Reden und Taten, aber seine sinnlichen Lippen haben ihn tief beeindruckt. Kurzerhand ist er mit einem Heilbutt einen Tauschhandel eingegangen, hat seinen Oberkiefer gespendet und im Gegenzug eine wunderschöne volle Oberlippe erhalten. Keine wirkliche Mutation also. Für die Wissenschaft wird es in Zukunft wichtig sein, bei vermeintlichen Mutationen immer auch die Hintergrundgeschichten genau zu prüfen.